Last time we checked in with Ben Sargent, a.k.a. “Dr. Claw,” his underground lobster lair in Greenpoint was being shut down by the Health Department. So did he go further underground? Actually, he tells us, it wasn’t an option: “I made the mistake of letting it be known who I was, so it was really hard at that point.” Getting into the legitimate restaurant business didn’t seem like an option either, even if he once operated Hurricane Hopeful (where Surf Bar now is): “I had so much fun doing it the way I was doing it,” he says. “I felt like if I did a legit version all my customers were going to be sort of disappointed.” So he went out looking for a new gig, and boy did he find one. 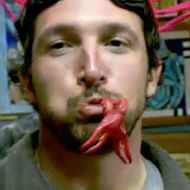 His show, Hook, Line & Dinner, premieres on the Cooking Channel on June 7 at 10:30 p.m. An offshoot of his web series Seafood Secrets of the Brooklyn Chowder Surfer, the show finds him coming aboard with fishermen all over the country and then visiting restaurants to see how their catch is prepared. Watch a clip, and hear more from Sargent below. What’s the most surprising thing you discovered about fishing and seafood over the course of the show? I had been cooking very simple New England stuff the whole time I was in New York, so it was great to get out there and see the spectrum from the fry house to full-on serious seafood operations. I think a lot of people see fish and seafood as an industry in turmoil, and I don’t see it that way; there are certain challenges and we’ve definitely overfished some places, but there are enough sustainable methods of fishing that there is hope. What are some of those sustainable methods? I think the right way is for the fishermen to be getting a higher price for what he’s going after, which means he can catch less fish, which means he can use a method that’s more responsible and kills less bycatch — line fishing being the best thing. If a guy can go out and use his same trawler but set it up now for going with a line or use that same trawler and go with a gill net, now he’s not scraping the bottom of the ocean and completely ruining the habitat for the next twenty years. Fishermen are getting really well educated on this stuff, because their livelihood isn’t going to be there unless they get really smart about it. And the chefs have to get smarter because now the consumers are getting smarter — if you consider yourself a rock star celebrity chef and you put bluefin tuna on your menu and the wrong person walks into your restaurant, you’re getting caught with your pants down. What fish do you now know to avoid? I stay away from swordfish and a lot of the faster swimming fish, and almost all of the tuna. Bluefin is the one everyone talks about, but there’s not enough tuna left in this world. Chilean sea bass is coming back, but what used to be a yearlong season is now a month or two months. It tells you something that there used to be enough to fish all year and now there’s only enough to fish on a month. I think we can err on the side of being overly cautious. Do fishermen feel the same way? They’re fishing with better technology, so reports come in and the fishermen say, “We’re catching way more than in years past.” Well, that’s because you’re going out with a boat that has ten times the capabilities, so of course you’re going to get more fish. But that doesn’t tell you how many fish are left in the ocean. Fishermen don’t always like that I play hardball when it comes to this stuff, but I think fishermen are coming to the other side — you’ll see it in places like Maine where the lobster fisheries are self-regulated. These guys know that [if they overfish] they won’t have jobs and Maine won’t have a tourism industry. In the case of the stone crab, scientists and fishermen figured out they don’t have to kill crabs — they can take the claw and release it back into the water for it to generate an even bigger claw. It probably doesn’t feel so good when you wrench its claw off, but it’s an escape mechanism, so I don’t even think it hurts the crab. Is there a “don’t eat fish on Mondays”–type rule that you picked up along the way? My personal rule is: If you didn’t see it swimming before it lands on your plate, then you don’t want to eat it. What I really learned was that we in New England live in a pretty spectacular seafood region as far as diversity goes and as far as caring for the oceans. I have a sense of pride about New England that I didn’t even know I had. What about New York City? What do you catch around here? I fish out in the Rockaways, in the Hudson, and the East River is my stomping ground. I love surfcasting and going off the docks. I’m not a bait guy — I use plugs and lures. It’s a little harder, but there’s so much action involved. I get bluefish and striped bass. How do you like to cook them? One of my favorite ways to do a bluefish is tin foil with a little bit of mayo on top. I’ll throw some onions in there and maybe a little paprika on top, and I’ll put it on the grill. Bluefish is a little fishy for some people, and I feel like the mayonnaise does good things for it. The striped bass is a little more delicate, so you can do really nice filets with that. I’ve also smoked bluefish — that’s where that fishiness actually imparts a lot of flavor and moisture. Your travels took you from the Bayou to the Everglades to San Francisco, South Carolina, and Santa Barbara. So what’s your favorite region for seafood? The northwest is just spectacular. There are certain things you’ll get there that you won’t find anywhere else — Dungeness crabs and all kinds of crabs, really. The West Coast is so wild. The flavors that come out of there are sort of new and inspiring. And the cooking, too. In Oregon, we went into Eric Bechard’s place, Thistle. It’s off the beaten path pretty far out of Portland, but he had enough of a following that people could find him somehow. In Oregon, the whole farm-to-table thing is just as important as the whole sea-to-table thing, and he was using truffles he had gotten from this guy who had a special dog. The guy walked into the restaurant saying, “I picked this today,” and Eric whips out $100 and that’s the truffle that ended up on our fish. Where do you like to eat fish in New York City? If the piggy bank permits, Le Bernardin is obviously the place to go. I’m actually a big fan of the Red Hook Lobster Pound — they do a pretty good roll. They just launched a food truck, as did Luke’s Lobster. Which roll do you like better? There’s no comparison. At Luke’s, the lobster is being shipped in kind of cold. It’s served too cold, in my opinion. Temperature is a really important thing. When you serve lobster out of a really cold refrigerator, not a lot of flavor comes through. They do some things at Red Hook that I totally concur with — a little drizzle of butter, and the butter has a little garlic in it. I think they throw some chives on top. Did you feel the need to live up to the macho standard of other dude travel shows (Man v. Food, etc.)? My show is exactly the opposite. The production company kept asking the network, “Are you okay showing Ben in this light — he’s kind of being made fun of here. Is it okay that he doesn’t know how to do this or is making a fool out of himself or did that wrong?” It’s hard on a boat no matter how experienced you are — you’re going to make a lot of mistakes. And there were a couple of times when I just couldn’t hold it down.